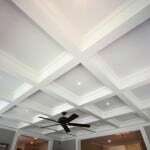 Looking for inspiration for your coffered ceiling project? If so, this portfolio is designed to help. To truly appreciate a Tilton Box Beam Coffered Ceiling System is to see one in person, but since that’s not always possible we’ve prepared the following collections of project photography, 2D design drawings and 3D renderings to help you gain an appreciation for how our coffered ceiling ideas can inspire you for your current or future projects. The examples found in the following sections demonstrate both the possibilities and the flexibility of our proprietary ceiling system. The coffered ceiling pictures found in this section showcases the Tilton Box Beam Coffered Ceiling System as it has been installed and finished in a variety of settings. The addition of an authentic box beam coffered ceiling makes any room a more special place, and Tilton Coffered Ceilings gives you the ability to include this feature with confidence, ease, precision and speed. 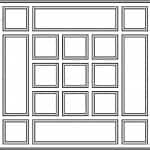 The 2D CAD drawings found in this section give you a sense of the design possibilities of the Tilton Box Beam Coffered Ceiling System and demonstrate the type of drawing you will receive for your review and approval when commissioning us for our design services or when you place an order for your coffered ceiling. The 3D renderings found in this section give a more comprehensive and realistic view of various box beam coffered ceiling ideas. 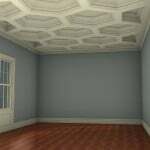 Tilton Coffered Ceilings’ offers this type of rendering service as an additional resource so that you or your clients can fully visualize the finished coffered ceiling treatment before it is manufactured and installed. Tilton Coffered Ceilings Can Help You with All of Your Coffered Ceiling Ideas. Contact Us Today!